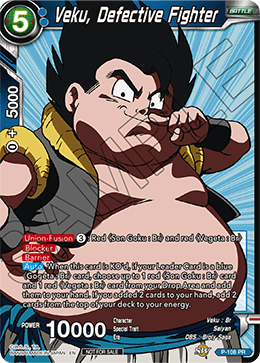 When this card is KO'd, if your Leader Card is a blue 〈Gogeta : Br〉 card, choose up to 1 red 〈Son Goku : Br〉 card and 1 red 〈Vegeta : Br〉 card from your Drop Area and add them to your hand. If you added 2 cards to your hand, add 2 cards from the top of your deck to your energy. When you play this card with , add 3 cards from the top of your deck to your energy. 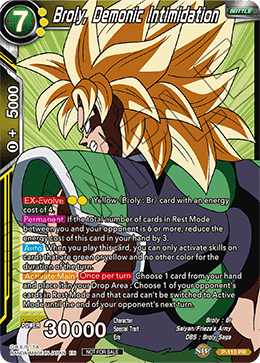 : Yellow 〈Broly : Br〉 card with an energy cost of 4. If the total number of cards in Rest Mode between you and your opponent is 6 or more, reduce the energy cost of this card in your hand by 3. 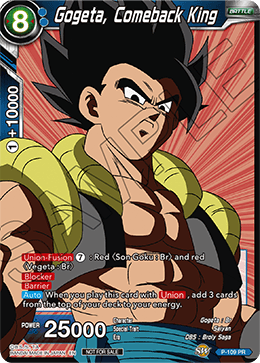 When you play this card, you can only activate skills on cards that are green or yellow and no other color for the duration of the turn. Choose 1 card from your hand and place it in your Drop Area : Choose 1 of your opponent's cards in Rest Mode and that card can't be switched to Active Mode until the end of your opponent's next turn. If the total number of cards in Rest Mode between you and your opponent is 3 or more, reduce the energy cost of this card in your hand by 2. 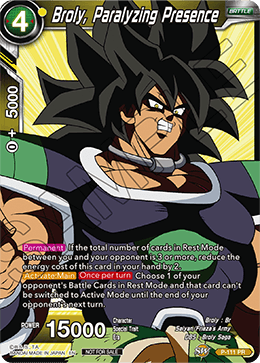 Choose 1 of your opponent's Battle Cards in Rest Mode and that card can't be switched to Active Mode until the end of your opponent's next turn.